Make a solid 4M volcano and watch it errupt with bubbly, fizzy lava. Paint and decorate the mould with lava flow, landscapes etc. Put baking soda and vinegar into the "crater" and perform an amazing eruption in front of your friends and family. An awesome science project that makes a cool desktop decoration. When constructed the volcano is approximately 9.5cm tall. 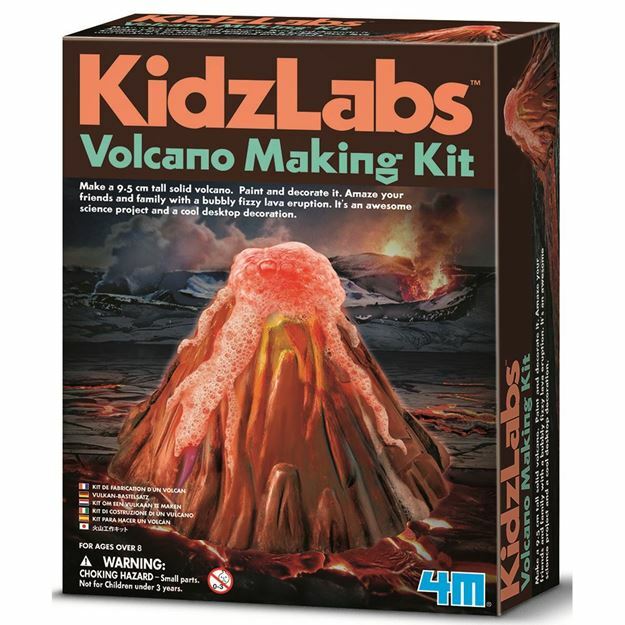 Includes: a 2 part volcano mould, 2 packages of fine quality plaster, paint strip, brush, stirring tool, fun graphic boards for decoration, volcanic scene, baking soda and detailed instructions. Age 8+ years. Part of the KidzLabs range. Distributed in New Zealand by Holdson.